A Branching Streams Sangha Profile, the second in a series of articles introducing sanghas affiliated with San Francisco Zen Center in the Branching Streams network. 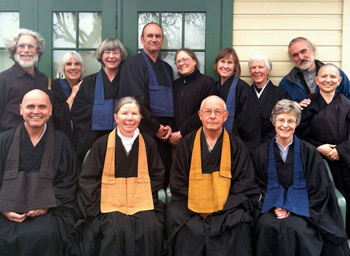 Ashland Zen Center has been offering Soto Zen practice in the Rogue Valley of southern Oregon for 21 years. We provide nonresidential, temple-based training for laypeople and monastics in a small town situated in a beautiful mountain valley. Doubly fortunate, we have two founding teachers: Etsudo Patty Krahl and Jintei Harold Little, who received dharma transmission from Keido Les Kaye, student of Suzuki Roshi and abbot of Kannon Do Meditation Center in Mountain View, CA. Our practice consists of daily sitting, sewing, samu (mindful work periods), gardening, sesshins (longer sittings), practice periods, dokusan (individual interviews), beginner�s trainings, classes and discussion groups. Our practice activities are guided by teachers, priests and a practice ryo of temple officers�tenzo (head of the kitchen), work leader, ino (head of the meditation hall) and director�and are supported by a board of directors. Our four-day weekly schedule includes morning and evening zazen, walking meditation, service, a period of cleaning, and a dharma talk. Every month there is a one-day sitting or sesshin, and ceremonies take place seasonally. These include Buddha�s Birthday, Segaki, Buddha�s Enlightenment, and Bodhisattva Ceremonies on the solstices and equinoxes. Ashland Zen Center is an intimate temple with a high level of direct, personal attention from teachers and deep dharma friendship within the sangha. It is not possible to remain anonymous! The opportunities to create vibrant temple life and to connect with others are myriad. It is a small town; we see each other in our everyday lives and share many experiences, including the births of babies and the deaths of parents, spouses, friends and sangha members. Fourteen students have received lay Buddhist precepts, and two have ordained as priests with Jintei and Etsudo. In addition, over the years our sangha has included people who received jukai at SFZC, Kannon Do, Sonoma Mountain Zen Center, and other temples. When the sangha steps out of the zendo together, activities over the years have included multi-day �Mountains and Rivers� camping retreats in the high mountain wilderness; a strawberry shortcake booth at the Fourth of July festivities, and inviting the whole town to join in making �Jizo for Peace� flags, which Great Vow Monastery presented to the Nagasaki Peace Museum in Japan on the 60th anniversary of the bombing of Hiroshima and Nagasaki. The temple grounds sit on rich soil. Every year the tenzo preserves apples, blackberries, figs and plums from the bounty. 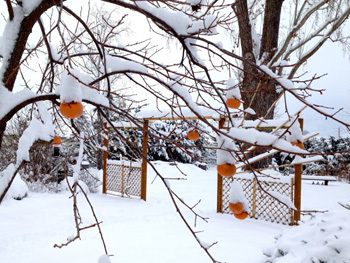 Last year a persimmon tree yielded 150 persimmons, and the vegetable garden supplied fresh produce for sesshin. The giant old cottonwood tree in the center of the property is home to hundreds of birds. The grounds provide habitat and sanctuary for creatures of all kinds. Even a temple cat adopted us! Quan Yin Cottage, nestled between an herb garden and our Jizo garden, is also a place of sanctuary. 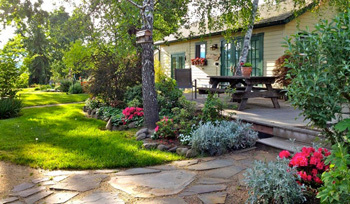 We rent the cottage to people seeking privacy and peace, and use it as teacher accommodations during sesshins. How did all this happen? Ashland Zen Center began when our founding teachers set up a few cushions in their living room once a week. In the spirit of Suzuki Roshi, Harold and Patty simply invited people to join them in zazen. From that invitation in 1993 developed a sitting group. When we outgrew that space, we shared space in a beautiful aikido dojo. As practice deepened, we became the Siskiyou Sansui Sangha, named after the Siskiyou mountain range that surrounds the valley, and sansui, Japanese for �mountains and rivers.� We incorporated as a nonprofit and became Ashland Zen Center. Having grown again, we rented a little house in the historic district and put up our first sign. Then in 2005, through a big envisioning and fundraising process, the sangha bought an acre near the edge of town. 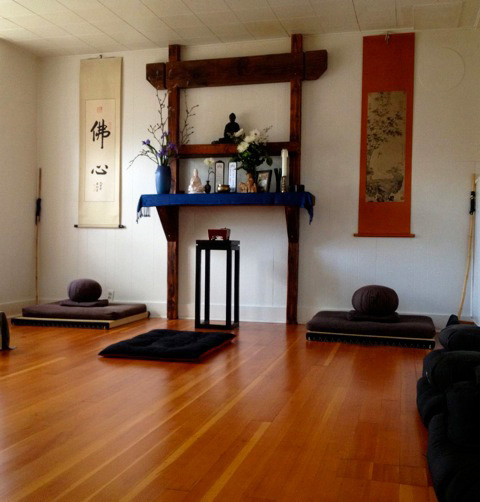 Everything at Ashland Zen Center has appeared through the donation of time, money and effort. Countless gift-bestowing hands manifested the zafus and zabutans; temple bells; altars; Buddha and bodhisattva statues; framed art; Buddhist library; butsudan (founders� altar) from Rinso-in, Suzuki Roshi�s home temple in Japan; ornamental trees; gates, benches and more. 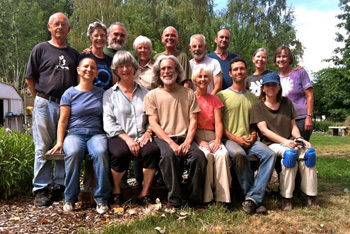 We remodeled an old farmhouse, cottage and barn, and have continued joyfully practicing to this day, cultivating Suzuki Roshi�s dharma seed in the Rogue Valley. Visit SFZC�s website for a directory of Branching Streams sanghas, or for more information, e-mail us at branchingstreams@sfzc.org. For more about Ashland Zen Center, visit ashlandzencenter.org.